Treat yourself to a set of Buffy Brushes and experience the most delight filled way to color. Buffy Brushes are simply the best tool to use for all coloring tasks. They are without a doubt the quickest, easiest and most fun way I have found to apply color to all my stamped, paper craft, altered arts or scrap projects. They are compact and comfortable in the hand. The brushes have thick but not cumbersome bristles that are flexible enough to quickly create colorful backgrounds of color by using simple sweeping strokes in a back and forth motion. Buffy Brushes are so versatile that they can create subtle layers of gradations of color or softly blend complementary colors across a card or a page. Using the Buffy Brushes in repeated applications produces dramatically vibrant layers of deep, rich color with very little effort. The same charming little brush can produce delicate watercolor effects of softly blended colors that are perfect for the vintage look of our detailed rubber stamps. The supple Buffy Brush can be pinched to draw thinner lines or bunched to pounce layers of color for striking effects. They are wonderful edging tools and when combined with templates or stencils will create sensational looks quickly and easily. Perhaps, like me, you have been frustrated with the various blending tools. The problems became most evident after my adorable husband designed a series of beautiful ladies faces for our line of rubber stamps. It was my job to make samples for our display boards and I tried everything to create just the right skin tone and blush. But in my hands the sponges that promised delicate shadings resulted in splotchy blobs. The daubers often made little moon shaped smudges everywhere when I wanted soft blushes, and those pointy make up sponges were a mess of hard edges and finger marks. Brayers offered coverage but all too often left lines and stripes that did not blend. Chalks powdered all over the stamp image, the table and me and still needed to be set or the color just rubbed off. Pencils and watercolors were streaky or blotchy. The moment I saw the Buffy Brushes I thought of them as mini make up brushes and immediately knew what to do with them. I began to use the clever little brushes by stroking the ink from the stamp pad directly onto the paper. The results were light and delicate and the ladies finally looked pretty. All those disappointing coloring tools moved farther and farther back on my art table. I did not think that I was inventing a new technique. I was just desperate and then delighted with my discovery. 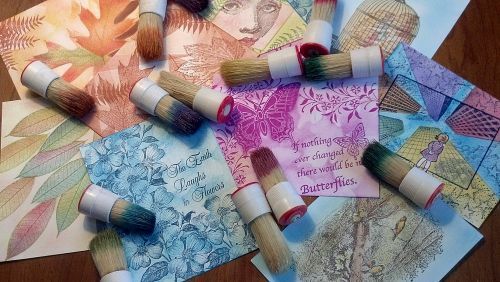 The Buffy Brush is a versatile tool you can use with your favorite dye based stamp pads, also liquid inks, mica sprays, chalks, watercolor pastels and all other water based mediums. Use one brush per color as mixing colors on the brush and pads only contaminates them both and gives you muddy results. If you assign one brush to one color it will get better and better with each use. Rubbing off the excess color after using pigment inks or a quick rinse in clear water after using mica paints is all that is required to maintain the brushes soft texture. I do not recommend using them with solvent or oil-based inks as it shortens the life span of the brush. Those inks require more drastic cleaning methods. I also do not recommend washing the Buffy Brushes with soap because it washes away the natural oils that hold the shape of the brush and the color. Be careful about never soaking the brush since it can soften the glue holding the bristles in the base of the brush. Dry them lying down sideways rather than standing up. Do not ever use a heat gun to dry the Buffy. It will eventually ruin the bristles. You are probably like me and despite all the pads you own, you habitually return to your favorite colors, usually a dozen or more. I find that I usually work with about twenty colors. I assign a Buffy Brush to each color and do not mix them up. I write the color number or name on the bottom of the brush to avoid confusion. The sturdy little Buffy Brushes stand up at attention on your worktable and their petite size makes storage simple. I like the little sets of three drawers you can find at office supply and general merchandise stores. One drawer for each color family of brushes is perfect. If the yellow brushes bump up against each other there is no harm. If the blue brush rubs a yellow brush it is a mess. So I have two sets with one drawer for each color family, red, yellow, blue, green, brown, and purple. Treat yourself. Start using Buffy Brushes and get swept away by a rainbow of change in your color techniques.